I’m not a naturally organized person. I tend to be somewhat forgetful, unfocused, and a data pack-rat. A deadly combination in a world where the data I'm interested in looking at is growing at an exponential rate. Until I upload my mind and join the singularity, these are issues I need to handle myself... And so, one month ago, I took a substantial step toward refactoring the way I view and organize my online data. The first is obvious. In such a busy world, it's easy to overlook the small tasks in favor for the big ones (such as "eating", "sleeping", and "not doing work".) Additionally, it is a glaring reminder, a line be-smudging your otherwise cleared list of things that ought to be done. Guilt works, even if you're the only one that will ever look at this list. The second reason is more often left out, but equally (if not most) important. By defining the task you give it substance. It ceases its Schrodinger-esque existence in your mind and resolves into clearly defined work. You don't just know what to do, but you've put thought into how to do it and how much energy it may take to complete. I’ve tested several dozen To-Do and organizational manager apps over the past several years. Most of them are either too niche, too simple, or overkill for my needs. The two tools I had the most luck with were Toodledo and Evernote. Disclaimer: The following tools can be used in many ways. I subscribed to a particular time-management methodology called Getting Things Done (GTD). I'm not going to go in-depth on the actual techniques in this article. If you're interested, there's a decent LifeHacker article that describes the process better than I could. Toodledo: Toodledo is a very classic time/task management service. It had all of the bells and whistles necessary to quickly create and track tasks and even included several “power user” features that let you customize what data points you cared about. However, the website was clunky with unpleasant user experience and the mobile apps were nothing to write home about. Worst of all, the integration with browsers and other apps was lacking. Evernote: I subscribed to a fairly GTD (Getting Things Done) centric task workflow described in The Secret Weapon, which totally sounds and looks like a terrible 90’s infomercial. The process actually allowed me to use Evernote’s labels pretty effectively, but the lack of proper searching and an app that was clearly more designed to display documents than short task descriptions ruined the experience for me. The service needed to have an app and a website. Contexts (or projects) and labels were a must. Conversely, I wanted an “inbox” where uncategorized tasks go. Unfortunately most of these features were either behind a paywall or outright missing from most services. With a growing list of needs/wants, I chose to do the only sane thing. The spreadsheet weighted the existence (or paid option) of various features. Each of these elements contributed to a total weighted value that all tasks were compared against. For example, app and website UX was weighted fairly high, while nested labels and goal-keeping had relatively low weights. The final score was the final weight of all existing/paid/missing features. I ended up choosing a paid service called Todoist. Todoist is actually free for casual users, but did not include labels or filters as part of their free platform, either of which would have been a deal breaker for me. After careful consideration, I chose to pay the $28/year subscription fee to test out the fully featured service. The website is very snappy and interactive. Being able to freely organize tasks, labels and projects just by clicking and dragging was a game changer. You could also assign tasks to labels or projects by dragging them onto the task. Decent integration with chrome and gmail. Adding a website or e-mail to a task is only one or two clicks away. It’s basic, but incredibly useful. Adding a task to my inbox is a click away on my desktop and mobile. It really doesn’t get any easier than this. Recurring tasks, reminders, location alerts. These sound simple, but I’ve put a lot of tasks on recurring schedules, especially goals like exercising often and reading in the evenings. My current system involves creating projects for major contexts in my life. To the right you can see the major projects I separate most work into. There are sub-projects as needed. I also use labels to denote high level concepts like “Planning”, “Low-Energy”, “Writing” and so on. 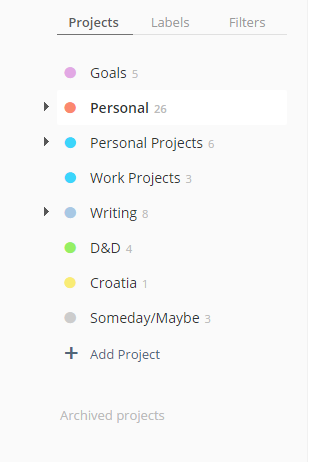 I also include a Goals project that tracks several tasks that I have set as recurring reminders. After a month playing around with Todoist, I'm very glad I made the purchase. I've found it easier to organize and prioritize daily tasks as they occur to me and offload my thoughts before I go to bed. While this tool may not work for everyone (the other services I tried work great in their own right,) I've found it has made an enormous impact in my life. Software Developer at a Stealth Mode Start-Up in Menlo Park. Enjoys Reading, Coding and Flying (Crashing) his Quadcopter.